Living in warm climates for most of my life, I've always taken cooling seriously in order to keep my rig(s) alive. When it's 110 out in the middle of the desert, keeping the water temp down keeps the rig working and keeps me from having to lay under it to figure out what's wrong. Cooling effects the engine, transmission and every other part of you vehicle. Little did I realize that moving to Colorado would have an equal cooling issue that I never thought of before - slow, technical wheeling at high altitude causes the temperature to climb in my Jeep. I started to wonder about putting louvers in my hood to let the hot air escape when sitting or idling along a high mountain pass. I've seen everything from do-it-yourself inserts from junk yard cars to louvers installed by craftsmen and then painted over like they were factory. Some look really nice and professional and others...well... you get the point. 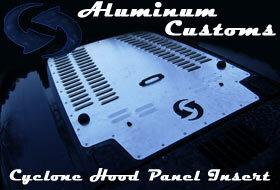 When I mentioned on a mailing list that I was interested in installing some louvers, Jay from Aluminum Customs called me about a new product they had recently put on the market - their Cyclone Hood Panel Insert (although I guess I would refer to it more as an "overlay" rather then an "insert"). My first impression after looking through their web site was that it was really too big, and larger than what I was looking for. Having said that, I decided to take the plunge anyway as it still looked better to me then grabbing something from a junk yard. I also figured I would get it powdercoated to match my rear quarters so it wouldn't be so shiny when I got done. So, as usual, UPS dropped off the parts and I felt like a kid on Christmas morning. Aluminum Customs does need to work on their packaging a bit, as my insert was slightly warped from its travels through the system (I've been told they have made some changes since I got mine). The package included the panel (which had it's edges covered in packing tape, presumably to keep them from pushing through the cardboard shipping package, and later proved to be a bit of a pain when install time came), a bag of stainless hardware (bolts, washers and locking nuts), a template for cutting your hood (eek) and a decent set of instructions. The aluminum piece is well-made, has no sharp edges, and the Aluminum Customs Cyclone logo built right into it. It certainly looks custom-made. Once I took it out of the package I laid it upside down on the carpet, put the cardboard shipping package on top of it with some weight and took the slight warp out of the aluminum. Enough so that I didn't ask them to send me another one (which they said they would do if I was unhappy). Realistically, this is the largest issue I had with the product or the install.